As professionals, design is a subject of interest to architects and interior designers. So the Triennale Design Museum is an unmissable part of the itinerary at the Milan Fair. Located inside the Palace of Art building, the Triennale allows visitors to explore excellence in design through various points of view, and every year, the museum changes the topics covered, renewing and transforming itself. At Simply Sofas, we're especially interested in how design combines the disciplines of science and art, because this is vital to any good piece of furniture. Comfort, ergonomics and quality demand years of scientific research and testing, while finesse, beauty and craftsmanship call for an artistic ability above the ordinary. And so, although often outside the realm of furniture, the displays at the Triennale have much from which to learn and draw inspiration. One such exhibit that combined art and science was the 'Coffee Drop' installation by Italian coffee brand illy. The exhibit featured a single drop of pure coffee, suspended in mid-air. Created for Illy by UK artist Alistair McClymont, the work represents the perfect balance of fine coffee. To achieve this feat of suspending a droplet of coffee in mid-air, McClymont engineered a vertical wind tunnel, based on an early 1970's design. Using wood, fibreglass, steel mesh, fan, and special aluminium honeycomb, the wind tunnel was perfected through a year long process of R&D, to finally arrive at a setup with a laminar airflow so smooth, that it could keep a droplet hovering. All of this advanced engineering that created the beautiful sight of a coffee droplet suspended in mid-air, was then combined with a piece of music written for illy by world-renowned composer, Ludovico Einaudi. Made out of 9 tunes, the music represent the 9 aromas of coffee - caramel, chocolate, toasted bread, floral, fruit, smoked, sweet, bitter and sour. Each tune can be enjoyed individually, or they can be combined together in a symphony. Art, science and design, combined at their very best. Here are some of the other interesting works of design from around Milan and the Triennale. 80,000 watch parts (above)! That's the number of "base-plates" (the structural device that supports all of a watch's components) that come together to transform space in Citizen's 'Light is Time' installation at the Triennale. Developed jointly by Tsuyoshi Tane and Citizen's in-house Design Team. Perhaps the most sensory experience at Milan Design Week - a visual spectacle like no other. One theme explored at the Triennale's Design Week was the impact of the global economic slowdown on creativity and design. Interestingly, creators everywhere are of the opinion that the restrictions of the current economic climate have only served to strengthen imagination and creativity. A special exhibition at the museum brought into focus this dialogue between past and present, reflecting the concerns of the Italian design industry today. Product design, furniture and fashion were all part of this exciting and unique display. Gio Ponti was among the most influential architects of the 20th century, renowned for his endeavours to combine art and architecture. Ponti designed many famous buildings around the world, including the Pirelli Tower and the Denver Art Museum. His brilliance was remembered at the Design Week through a display that showcased some of his interesting creations (above). Another novel idea was Italian architectural firm, Studio Dodici's 'Barrel12' concept. Described as an amalgamation of ethical idea of recycling and the poetry of transformation, this concept transforms a barrel into a customised, multifunctional storage space. As Francesca Cutini and Pierangela Crosti explain, this is not just about reclamation, but also about craftsmanship that renders every object unique and original. By now, some key trends in the areas of construction, materials and colours are becoming evident at Saloni 2014. While manufacturers have moved to more frugal and sustainable use of resources, quality continues to remain a key focus. Do more with less - this drive is reflective of political and market sentiments in economies across the world. Minimalist design that does not compromise on comfort, aesthetics or quality is indeed a tall challenge, and perhaps nowhere is this as beautifully achieved and illustrated, as with Natuzzi's new Re-vive recliner. Dubbed the 'first performance recliner,' this is one of this year's biggest launches and is the result of years of research and studies on how the human body sits and moves. Designed by New Zealand designer Kent Parker, Re-vive is a collaborative project between Natuzzi and Formway Furniture. The chair does away with all the levers and adjustment knobs typically employed on recliners to control posture and other settings. Instead, a uniquely engineered 'Responsive Recline' system allows the chair to intuitively move with movement of your body, delivering optimal support for every posture. Unlike any other recliner, the armrests move effortlessly along with you as you recline, and a light rocking motion creates a feeling of weightlessness, whether you're upright or reclined. The minimalist approach means the chair has only seven assemblies - leaving virtually nothing to fail or go wrong. Of the Chromatic trends at Milan this year, the strongest is light blue. Blues are consistent as a theme across the last few years, and as the colours moved from blue grey to aquamarine to sky blue, reflecting the shift in the tenor of the marketplace to a positive and pleasant future, new design trends embody many variants of the blue colour range. Coming up are more reports on noteworthy new releases by brands, and innovation by young designers. Stay tuned for more, LIVE from Milan! Across the brands and exhibitors at Saloni 2014, one sees a renewed attention on upholstery. Rightly so, since even the most comfortable, perfectly crafted sofa frame and internal amounts to nought if poorly upholstered. One manufacturer that has this focus particularly strong is Editions - which is now NatuzziEditions! New leathers and new qualities of leather add to this Italian maker's impressive upholstery portfolio. Much like skilled woodworking artisans who strive to bring out distinctive grain patterns in wood, NatuzziEditions' masterful tanneries have dyed leather in a process that brings out the beautiful natural features of fine leather - wrinkles, creases, and differences in tone and grain. A major point of interest is the Omega Configurator (below) showcased by Koinor, the inventor of many benchmarks in furniture. This innovative system enables never-before flexibility and control, allowing you to set your sofa up perfectly to your satisfaction. Koinor offers L-seater, straight sofa, single, swivel and other variants with the Omega system, making for maximum play and coordination. In another display of technological and design brilliance, Calligaris grabbed attention with an extensible table (below) that's bound to leave every single house guest impressed! With their latest creation featuring a ceramic top and a sophisticated yet effortless retraction mechanism, the 90+ year old Italian firm reinforced the notion that few can match the style of a Calligaris extensible table. As booths go, Olivari has created one that stands out, with a simple simple contra design which proved to be a smart outlier amidst the strong play of colours at the Fair this year. And speaking of colours - yes, we have been keeping a keen eye on the palettes showcased across the numerous exhibitors. Stay tuned for our detailed report on the new colour trends that have emerged at Milan 2014! From today, we bring you daily reports and analyses of the latest trends and developments in the world of interiors, furniture and design - as it happens, LIVE from Milan Design Week! Here's a brief look at some of the things that we found interesting so far on Day 1 (within, as well as beyond, the domain of furniture). The turnout on Day 1 was strong. If the visitor numbers are sustained through the entire week, it bodes well for the interior and furniture industries this year, indicating good interest from design professionals and business visitors around the world. Although, we'll have to wait till the end of the Fair for Saloni officials to announce the precise statistics. Time will tell. A noteworthy development is the introduction of beds and linen by Natuzzi, the world's largest Italian furniture brand. This moves Natuzzi's offerings closer towards a 'total home' concept, making it simpler for designers and home owners to create coordinated, elegant spaces. As research has shown, the value of a well coordinated, beautiful home extends to far more than just aesthetic appeal. The state of the spaces we live in have an apparent effect on the state of our minds. Nicoletti Home's new creations in leather are indicative of the palette we can expect to see trending through 2014. German maker Koinor is well known for exceptionally crafted sofas for living, and of course, their distinctive 'dinner sofas'. Interestingly, Koinor is adding to their portfolio of reclining chairs. You can be sure these will have the same benchmark quality that their sofas have come to be known for. Adriani and Rossi were as surprising and impressive as ever. If ever there was any doubt, this collection of glittering heels and handbags is proof that, global economic slowdown or not, the Italian passion for innovation in design, and the drive to create something new, is still alive and flourishing. More detailed analyses and reporting follows from Day 2. The Milan Furniture Fair brings out the best in innovation in every furniture maker and brand. Some however, make an impact that goes far beyond trends, affecting, at a much larger scale, the way the industry evolves. 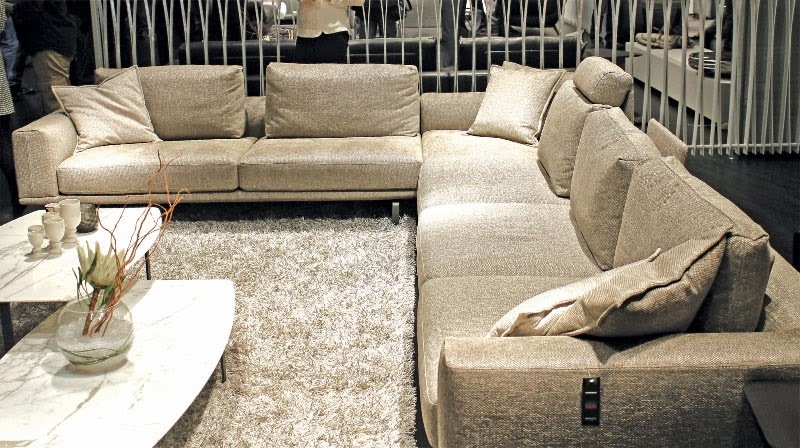 Such is Natuzzi, which, this year too held its own and made an indelible mark on the Fair. The charming and effervescent Pasquale Natuzzi, certainly one of the most enduring personalities of Salone Milan, took the lead. Amongst the many introductions is a new color and a new upholstery leather. 3.2 mm thick and made from the finest North European hides, the new leather is processed in Natuzzi’s own factories. There are also new fabrics. Apart from a slew of new sofa and chair designs, the collection has also taken some of last year’s best ahead with new versions. Natuzzi’s approach of coordinating all the elements of a living room is amplified this year. The center tables, coffee tables, lamps, carpets and accessories are stylized with more character. There are also a number of dining tables & chairs to go with the rest. To call the Tempo just a sofa would be inadequate; it is a whole system of style and comfort. The already iconic sofa consists of modules that allow for the possibility of various arrangements. The design of the fabric-clad sectional sofa is such that one can break down and alter an arrangement at will, adding freshness to the space without affecting the harmony of the elements, or simply optimising floor area. To create the right mood, there’s a Bluetooth device that plays music on surround-sound speakers which, incidentally, are also used in the Maserati. The controls are cleverly concealed below the fabric. The flexible back cushions are filled with down feathers, and, with the movable headrests, provide truly yielding comfort. Marble top coffee tables of different sizes and chromed legs, a lamp and a rug make up the complement, defining a character that’s distinctive and par extraordinaire. The famous Natuzzi Sound Chair now comes with Bluetooth, which means that you can feel and hear the music as you sink into the iconic shape. The Borghese is a new model designed for small spaces. The adjustable headrest has a mechanism that’s almost invisible, and the legs are wooden. Inverted piping running across the Respiro sofa makes it unlike any other. All in all, the collection embodied new details, greater attention to endurance and inspiring proportions, all packed into the familiar Natuzzi style. Natuzzi’s collaboration with the world of art was conceived in 2007 under a concept called the ‘Open Art project’, with the aim to make art accessible, bringing together untenanted expression and technical innovation. The collaboration that has taken root this year is with the famous Fabrizio Plessi, one of the most ingenious artists of our time. Spanning 40 years, Plessi’s work includes projects for Luciano Pavarotti, Louis Vuitton, Robert Wilson and Philip Glass and he is the only living artist to have exhibited at the Scuderi Papali at the Quirinale in Rome. While the Natuzzi booth at the fair reflected the theme currently envisaged in the collaboration, aptly named The Shape of Energy, the event that was held at the Natuzzi flagship store on Via Durini on the evening of April 10th brought it to life in grand style! Plessi is known for edgy combinations of video and various physical structures to create powerful art that inspires and excites, and such was the work at the Natuzzi store. On display at the ground floor was a unique assembly of low tables. Each table, with a multi-layered top composed of solidified volcanic lava, revealed, through an opening in the lava top, the incessant, fluid motion of molten lava beneath the surface, supplanted by the throbbing sounds of its passage. The theatrical effect of the installation is unlike any other. Plessi writes that lava means “lighting up our memories, passions or roots once more”, reflecting the dynamism, innovation and energy which have constantly inspired Pasquale Natuzzi and his company. Fabrizio Plessi will create, together with Natuzzi, an exclusive and exciting product collection - authentic pieces of art created for everyone, where the value of art merges with the value of design and materials.